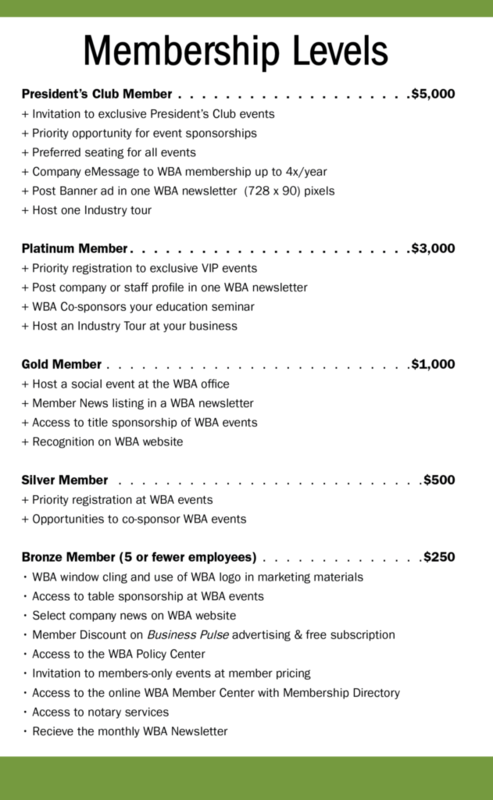 The WBA offers membership at different levels. Irrespective of your membership level, the WBA is your voice in Whatcom County. Whether you are a small or large business, private or public, in any industry or niche market, our mission is to support a positive business environment and provide a vast communications network to address issues concerning your business. Bring together some of the most successful business people in Whatcom County to identify and discuss the ideas, trends, issues, and opportunities most important to the business community. Build a support structure of thoughtful Whatcom County business people interested in preserving existing jobs and creating new ones. Gather input from businesses in every industry to find how we can best serve their needs and assist in removing obstacles that might be impacting their success negatively. Host speakers, seminars, and other special events to bring information, resources, and networking opportunities to local businesses. Publish information to inform, educate and promote our community and the businesses that make our community a great place to live. Act as a sounding board for businesses and a place where creative solutions can be addressed. Work with local governments to improve the business climate by identifying issues that stifle job creation and business success. Provide helpful information and resources to start-ups, existing companies and companies interested in locating to Whatcom County. Create many opportunities to connect the movers and shakers of the business community.